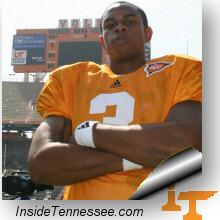 The New Orleans Saints took Tennessee wideout Robert Meachem with the 27th pick in the 2007 NFL draft. It’s an excellent value. Player Evaluation: Meeting expectations last season Meachem offers a lot of potential, yet still needs work to complete his game. Has the skills to develop into a number one wide out. Biography: All-Conference selection last season after producing a career-best 71/1,298/11. Started two games as a sophomore and totaled 29/383/2. Pos: Physically gifted prospect with terrific size/speed numbers. Plays with good balance and body control, and makes the difficult reception in contorted positions. Displays a burst of speed, tracks the deep throw and effortlessly makes the reception in stride. Stays low exiting breaks, positions himself to make the reception and extends to catch the pass. Neg: Inconsistent route-runner who slows into breaks. Not quick releasing off the line. Struggles in battles when he should not. Defensive tackle is the top need for the Saints and Alan Branch was still on the board. Linebacker is the second greatest need and David Harris was still on the board. Corner is the third greatest need and Chris Houston was still available. And didn’t New Orleans find a pretty decent receiver on the second day of the draft last year? The point is the Saints should have addressed their needs on the defensive side of the ball before taking advantage of a deep receiver corps. At least they picked up a talented receiver. Meachem has the speed to stretch the field and open up the underneath routes for Marques Colston. He can also produce after the catch. However, Meachem isn’t a great route runner and he needs to get more physical or corners will have some success pushing him around.